[...] I've found the results of the Beacon St. repaving pretty disappointing with respect to cycling. Before the repaving, the northbound bike lane was in really bad shape, but so was the paint, so there was little problem with biking in the main travel lane. Now, the paint clearly marks the bike lane, but it's full of rough pavement, bollards, and driveway ramps—totally unsuitable for bicycling in. In my experience, drivers feel more entitled to an unshared travel lane when there's a bike lane next to it, so this seems like a worse situation than before. I haven't been harassed yet, but it's just a matter of time, and I'm concerned that other cyclists will feel compelled to ride in the unsafe, narrow, obstructed bike lane. Do you know if there are plans to repair the bike lane very soon? If not, is that something you can work towards? We agree that the northbound bike lane on Beacon Street is currently suboptimal. The project has been slowed due to outside circumstances, including utility work and emergency gas repairs. The repaving that occurred on the Washington to Oxford section of Beacon Street (the section to which I believe you are referring) was done in order to repair the trenches created by the gas work. However, this is not the final pavement condition on the street. The driveway aprons that jut into the street are temporary because the street is a couple of inches lower than it will be when the project is done. The plastic bollards, while not ideal, are necessary to flag those driveways so that plow drivers can avoid them in the snow; hitting them could cause damage to the plow and injure the driver. Those posts will be removed (and the ones that are in good condition will be stored or redeployed elsewhere) once we believe we are in the clear in terms of snow, likely sometime in April. We understand that this condition is far from optimal, and sympathize; all of us bike on this stretch at least occasionally, and Ken, who lives on the street and is the chair of the Bicycle Advisory Committee, has expressed similar concerns already. The street will be paved, for good, sometime in the late spring/early summer. At that time, the northbound bike lane will be raised slightly to create some vertical separation for bikes, help prevent illegal parking, and make bikes more visible. The markings on the road will be striped with longer-lasting, higher-visibility thermoplastic, rather than the temporary paint that fades relatively quickly. I hope this addresses your concerns. Please let me know if you have any other questions. The Andrews Middle School is on Freedom Way, between Mystic Valley Parkway and Riverside Avenue. Plentiful parking, and the 134 bus stops on Riverside Avenue. It connects to buses from Davis Square at Medford Square. Hello, This is Captain Barry Clemente with an informational message. The Medford Police And Fire Department, along with Medford's Board of Health, will be sponsoring a Blood Drive at the Andrews Middle School Gym located at 3000 Mystic Valley Parkway on Tuesday July 31 from 2PM to 7PM. Anyone wishing to donate blood should call 1-800-RED-CROSS or visit redcrossblood.org and enter Medford P&F to schedule an appointment. The need for blood donations is constant, especially during the summer months. "Local non-profit CASPAR, Inc. (Cambridge and Somerville Program for Alcoholism and Drug Abuse Rehabilitation) will soon expand its tremendously positive impact on the community. The organization was selected to receive a 5kW solar array donation that, once in place, will reduce greenhouse gas emissions – and lower utility bills. The 5kW array donation from SolarFlair, the City’s installation partner, is the result of resident participants exceeding the goal of the citywide Solarize Somerville initiative to install 400 kW of installed solar capacity. So far, SolarFlair has installed 99 solar arrays, adding 531.34 kW of installed solar capacity to Somerville." Thanks so much to the volunteers who helped to get the word out during our program, and to those of you who were able to participate in the program to help us reach this goal. In the spring we'll have a celebration when they get their panels done. I'm delighted that this very worthy cause--in this time of the opioid crisis--can benefit from this green power and help them with their baby laundry and breast pumps! I hope this will warm your hearts during this chilly winter time, and that you have wonderful holidays, whatever you celebrate. It looks like the national discussion of climate issues may be stunted for a while. But that's all the more reason to get involved locally on making changes and influencing directions for our city. There's a meeting coming up to discuss this, details at the link. When: Monday, June 26, from 6 to 8 p.m. The folks at the city and other partners are planning a great series of events for the week that includes Earth Day. Have a look at some of these upcoming opportunities to do some local engagement with our neighbors. There are events for everyone. Kids events. Nerd events. Those of you who like to tidy things up--all sorts of stuff. Please check out the schedule at the blog post. Special note: I attend the CEUCC meetings, and I've been hearing about this really nifty climate simulation exercise for a while. The Apr 27 "World Climate Simulation" is supposed to be fascinating and engaging. Special Winter Hill note: Our nascent Winter Hill Neighborhood Association will be doing a clean up on the 30th. Let me know if you want to be connected with that. Celebrating our Sanctuary City. Sat Feb 4, 10am. Somerville High School. In the interest of spreading the word--despite the fact that right now I have limited info on this--there's a rally next Saturday, Feb. 4, for our city status. 30 years. That's kind of a nice round number. Let's celebrate. In case of inclement weather, the rally will be held in the Somerville High School Auditorium. Super news today: we have passed a new milestone! We hit 308.46kW of solar in our fair city with this program so far, and 61 systems. And our recent extension seems to have clicked with folks, so we've got a lot of new interest. Our donated array is within our reach now, for sure. "Site visits are now extended through November 23 and participants have until December 16 to decide if they would like to go solar." Winter Hill Neighborhood Plan Released! Announced at the Ward 4 Resistat last night. After two years of community process, we’re happy to announce that the Winter Hill Plan is to the next step! Click here to download the plan. We’re releasing the plan today, October 20, for the Planning Board to review. They will discuss the plan at a public meeting on November 3, 2016 (The meeting will be at 6:00 at the VNA Community Room at 259 Lowell Street). If you have any comments on the plan send them to [redacted]@somervillema.gov. More details over there, this is just an appetizer. In 2016 the State of Massachusetts will hold an early voting period for the first time. This gives residents the option to skip election day lines and vote during the 12-day early voting window. Residents who do not wish to vote early can still visit their usual poll location on election day (Tuesday, November 8). Monday, Oct. 24, 2016 – 8:30 a.m. to 4:30 p.m.
Tuesday, Oct. 25, 2016 – 8:30 a.m. to 4:30 p.m.
Wednesday, Oct. 26, 2016 – 8:30 a.m. to 4:30 p.m.
Thursday, Oct. 27, 2016 – 8:30 a.m. to 7:30 p.m.
Friday, Oct. 28, 2016 – 8:30 a.m. to 12:30 p.m.
Saturday, Oct. 29, 2016 – 11 a.m. to 5 p.m.
Sunday, Oct. 30, 2016 – 11 a.m. to 5 p.m.
Monday, Oct. 31, 2016 – 8:30 a.m. to 7:30 p.m.
Tuesday, Nov. 1, 2016 - 8:30 a.m. to 7:30 p.m.
Wednesday, Nov. 2 - 8:30 a.m. to 7:30 p.m.
Thursday, Nov. 3 - 8:30 a.m. to 7:30 p.m.
Friday, Nov. 4 - 8:30 a.m. to 12:30 p.m.
Hi neighbors: I send out a periodic newsletter with updates on the program. 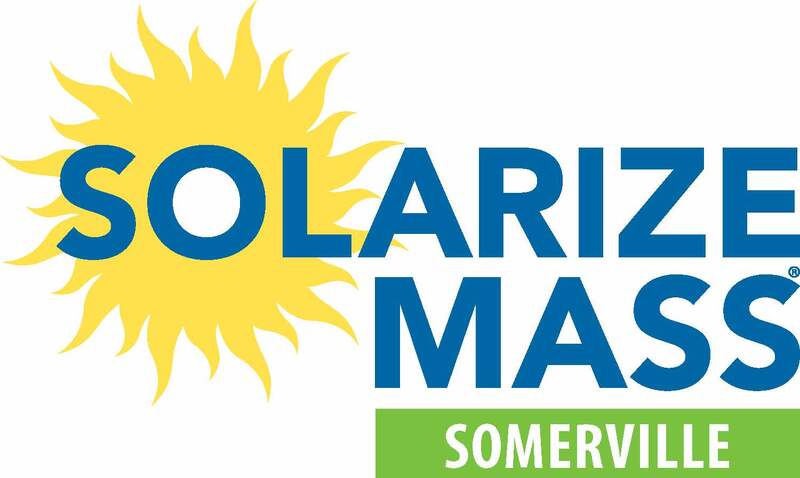 You can sign up for those at the Solarize Somerville site. But I thought I'd post this update here as well for folks who might not be on the list. There are various links and a video, I'll put it all below the LJ cut. Kids Activities - bubbles! crafts! Come learn about what Mothers Out Front is doing in Somerville and Medford to tackle climate change and promote a transition away fossil fuels - by fixing gas leaks in our city, fighting the expansion of pipelines, and other efforts. This is a chance to talk to others about Mothers Out Front, ask questions or share ideas, or just bring your kids to play. We are working to make change here in Somerville and Medford, to build statewide political will, and to protect our kids’ and grandkids’ future. Democratic Primary election, Sept. 8, a Thursday. Vote--on THURSDAY this week, folks. Just wanted to highlight the unusual day. A nice young canvasser just came by my house to remind me, and I realized I hadn't seen notice of it much on the social media channels. Solar 102: Going Solar for Multi-Unit Owners, Condo-Owners, and Landlords; event slides available. So it turns out we have a lot of neighbors interested in this issue. We filled a room with Cambervillens who wanted to know how this worked for the more complicated situations that we face around here. You can see the turnout in a photo here: https://www.facebook.com/GreenSomerville/ The funniest part for me was during my segment, people actually applauded my electric bill. We don't have a videotape of this event, but I do have a blog post up with everyone's slides. http://www.somervillema.gov/sustainaville/solarize-blog.html#multi And if you have any questions about the content, I can get you to the creator of that segment for more details. If you want to see my electric bill, it's slide 27. We also just got the video from our big launch event. I'll do a blog post with some viewing tips/times and the slides from the presenters soon. But if you want to watch the video sooner, feel free. I'll put that below the LJ cut. Important news: the state is proposing to reduce the SRECs for folks who get interconnected after early January 2017, and the draft proposal says that 1 SREC may = 0.80 in the interim until SRECIII comes along. Because solar has been so successful, we are starting to see incentives changing. If you have been considering solar, it really is time to act before incentives change. They will still exist, the payback time will just take you longer after that. As you might expect. the cities of Cambridge and Somerville are both facing similar challenges on this issue. So the cities teamed up for a special event dedicated to just this matter. There will be other general educational events still, and we are going to have booths at many city events about our Solarize program. But if you are in a multi-unit situtation this event is worth seeking out specifically. Join the Sunny Cambridge & Solarize Somerville teams for “Solar 102: Going Solar for Multi-Unit Owners, Condo-Owners, and Landlords” Tuesday, August 16 at Lesley University, located at 1815 Massachusetts Avenue, Cambridge. Doors open at 6:00 pm, event starts at 6:30 pm in University Hall, Room 2-078 on the Second Floor. Have your solar questions answered! Visit www.somervillema.gov/sustainaville/solarize for more info on the Somerville program. Visit https://www.energysage.com/sunnycambridge/ for info on the Cambridge program. The next big event is next Tuesday July 26, 6pm, at the TAB building, 167 Holland St., it's an evening of informational talks by representatives of the MassCEC (Clean Energy Center), the selected installer for Somerville SolarFlair, and the city's volunteer Solar Coach Mary Mangan, and we will help residents to understand some of the basic of solar power, the program benefits, and the process of going solar. 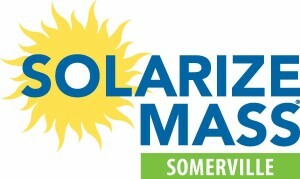 The Solarize website has been updated: http://www.somervillema.gov/sustainaville/solarize.html You can check the maps and see if your house is suitable for solar. There are other project-related things to explore as well. 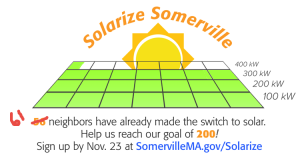 Please share the information with your networks to help us Solarize Somerville. We wanted to let you know that very soon we'll be making the big announcements about the program, and the educational outreach activities are about to begin. So be sure to stay tuned for dates and locations where you can hear about the features of the program, it's coming very shortly. Like other Solarize Mass communities, we will be offering residents a way to obtain solar PV for their homes in various manners. This can be outright purchase of a system, or with Mass Solar Loan assistance, or through a Power Purchase Agreement (PPA). A PPA is an agreement where the system is owned/maintained by a third party financier and then a homeowner purchases the power that's being produced on their roof for a lesser rate than what they are currently paying their utility. These choices can reduce the cost of green power for you. We hope to help you decide what might be right, if you are interested in solar power. If you have been considering solar, you should think about acting soon. The state's Department of Energy Resources (DOER) is making changes to the SRECII program, which is where "Solar Renewable Energy Credits" are assigned value. SRECII will stop taking new projects, replaced by an SRECIII program. We don't have the details for SRECIII yet. But if you want to obtain solar under the existing incentive structure, you have to act before January 8, 2017. You can sign up on our web site to be notified as soon as our real launch goes out publicly, or check back there soon for the press release and other details: http://www.somervillema.gov/sustainaville/solarize.html. So be sure to watch for email notices soon, and our city Solarize web site will begin to reflect the program features as well. If I got your name from previous conversations, you should be in my "interested residents" file and have received this by email. I'm the volunteer solar coach, Mary. SOMERVILLE - Mayor Joseph A. Curtatone is excited to announce a new home for the City's data sets, which gives Somerville residents easy access to the same data he uses to make decisions. Now you can take a trip to the Data Farm to follow data trends in the City and use the data for your own analysis. I have always appreciated the data that this city uses to make decisions about where to aim resources. I think it's very shrewd. They went all out with puns: "Locally sourced & handpicked food for thought", "Artisanal" data, and more. Winter Hill Neighborhood Plan Draft Released! We want your feedback! The draft of the Winter Hill Neighborhood Plan has enough substance that we felt it was important to offer you another opportunity to provide feedback. Click this link to download the plan. To provide us with your comments, questions, or concerns email us at [mem: redacted just to not encourage spammers]. The comment period will end on Friday, June 24th. Two interesting tidbits I noticed in the last couple of days. Media coverage on the water crisis in Flint, Michigan has made us all aware of the devistation faced by residents of the area. This event brings together experts to discuss the events that have been occuring, not as a crisis for just Flint residents, but as a window into water issues in America and Massachusetts. What lessons can be learned from the Flint water crisis? In order to vote in the March 1 Massachusetts presidential primary, you must be registered by Wednesday, February 10. Voters who are enrolled in a party can vote only on that party's ballot. Registered voters who are "unenrolled" can vote on any (one) party's ballot. Doing so will not change your "unenrolled" status. Use this form to check your registration status. Use this form to register, change your party enrollment, or change your registration address. If you have a Massachusetts driver's license or state-issued non-driver's ID, you can submit the form online. Otherwise, you will need to print it out, sign it, and mail it (or bring it to City Hall). More information on registration is on this page. mem-winterhill.livejournal.com - Celebrating our Sanctuary City. Sat Feb 4, 10am. Somerville High School. mem-winterhill.livejournal.com - Winter Hill Neighborhood Plan Released! mem-winterhill.livejournal.com - Democratic Primary election, Sept. 8, a Thursday. mem-winterhill.livejournal.com - Solar 102: Going Solar for Multi-Unit Owners, Condo-Owners, and Landlords; event slides available. mem-winterhill.livejournal.com - Winter Hill Neighborhood Plan Draft Released!